Boil the salt beef for 15 minutes. 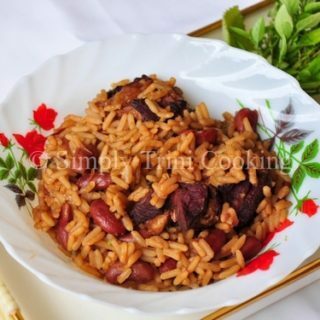 Place the salted beef in a pressure cooker, together with the red beans and cover with water. Cook for about 20 minutes or until soft. Remove the salt beef from the pressure cooker. Set aside. Carmelize the sugar in a deep pot. Add the salt beef. Stir to coat meat evenly with the carmelized sugar. garlic, onion, fine leaf thyme, celery and tomatoes. Stir. Note: From experience, adding the oil after lessens probability of the hot oil splattering on you. Add the red beans together with the optional pumpkin and ochro. Then add the coconut milk mixture and ketchup. Stir. Add rice and whole pimento pepper or hot pepper. Note: You may have to add a little bit of water cover the rice. Cover and let simmer until the rice is cooked. Note: While the rice is cooking turn occasionally and add water if necessary. When the rice is nearing completion lower the fire and let simmer. Continue turning the rice occasionally to prevent sticking.